Uluru (also known somewhat lamely as Ayers Rock) is a giant sandstone monolith in Australia with a circumference of 5.8 miles which reaches a height of 2,831 ft. above sea level. As impressive as these facts may be, they do nothing to describe the delicate beauty of the scene Kelly captured during a visit in May of 2007. In her words, “When it rains the rock catches water which runs down basins and gullies formed over the millennia to the ground where catch ponds form. There is almost always water running down from somewhere on this monolith. 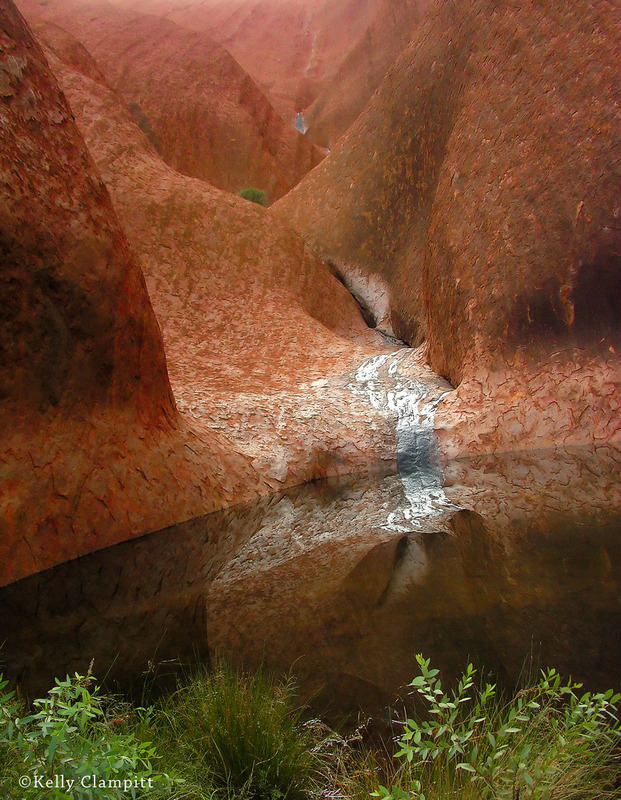 Thus the area immediately around the rock is like an oasis for plants and wildlife and magical to the Aboriginal people who request certain areas of Uluru, which were used in specific rituals and ceremony, not be photographed. I was fascinated by the feminine aspects of the etched stone, the reflections, and the silvery color of the light in the reflected water trickling down into the very quiet pool fringed by green plant life.” The colors, shapes, lines, textures and overall composition contribute to a totality that defies description. The gentle diagonal curve of the quiet pool is the final touch. This entry was posted in Australia, Uluru and tagged foreign, Kelly Clampitt, Nikon on September 16, 2011 by GAR. I definitely posted on this a long while ago, apparently posting from work doesn’t actually work. This is such a cool shot, I think setting it to 8×10 and cropping out the grass is something that would have come to my hand, but its an interesting perspective as it is. It looks like quicksilver is pouring from the rock. Quite splendid Kelly. I like everything about this photograph. I would enjoy seeing your other photos from Uluru sometime. This is a beautiful picture. When I see it I have a lot of imagine .